What Great Dane standard does this International Champion conform to ? This is extracting the urine by the gallon – nay, by the tanker ! FCI, championship titles, breed standard, breed clubs, this is monumental mockery… The joke is not even remotely funny. It’s just adding insult to injury. It’s beyond surreal and obscene – it’s completely insane. You want a definition of insanity? It’s reading the standard below and visualizing a dog like the above. That’s certifiable insanity. A rational human being reading the above description does not expect to see a dog looking like THIS. 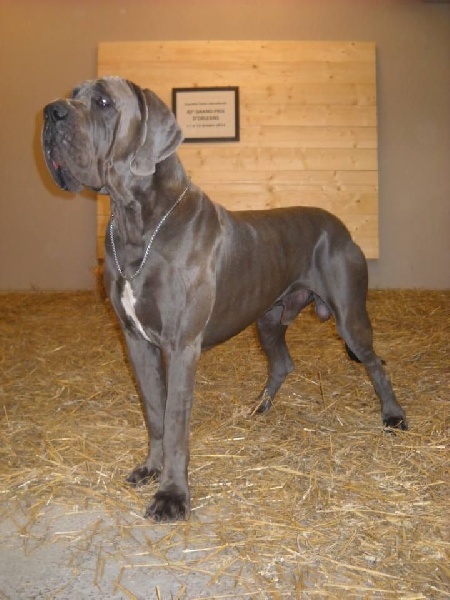 No matter how unreasonably one is prepared to misinterpret the description, a Great Dane is not supposed to look like a Mastino. 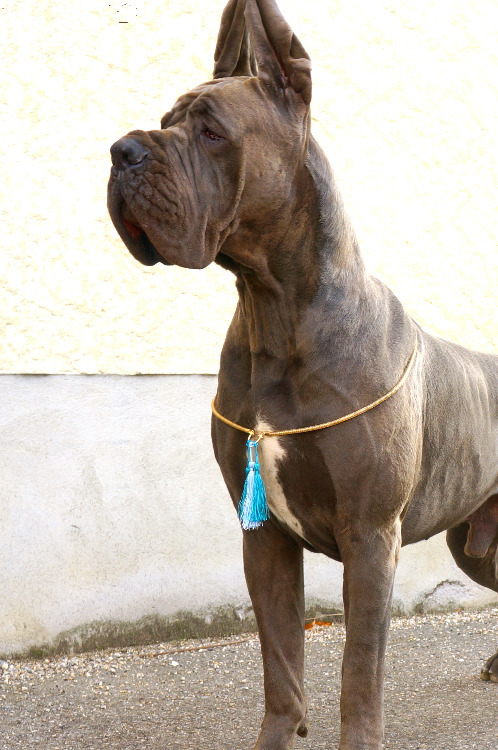 Not even an original Mastino, before that breed became a synonym for exaggeration & disfigurement. Where is the nobility ? where is the balance ? where is the well-constructed body? the elegance? the proportions? the lack of coarseness ? the unfortunate dog is the very definition of coarse. It’s the exact antonym of elegant. Crude, unbalanced, clumsily put together, misshapen, disproportionate in parts and as a whole, especially disproportionate and untypical in the head-to-body size ratio, dysfunctional, with no harmony, moderation, unity or quality whatsoever. It’s a messed-up disabled dog. OK, I get it – someone with zero education; someone who never went to school, never been near a museum, or seen even a single picture of classic art; never seen a Greek or Roman statue; never watched an art documentary or read a book. Yes, people lacking the basics of education wouldn’t know what Apollo means in this context. An illiterate person, or someone without culture & taste, with no interest in art, history, philosophy et cetera might think that Apollo could mean a shapeless blob. A lump. Or a potato. Hulk. Maybe even the Elephant Man. HEAD: In harmony with the general appearance. Long, narrow, distinct and expressive. Never wedge shaped. Finely chiselled, especially under the eyes. Eyes: Of medium size with lively friendly intelligent expression. Almond shaped with close fitting lids. The description again is very clear – it means NOT like THESE eyes ! Slack eye lids and showing red haw. Pretty clear huh ? Ectropion, entropion or macroblepharia. In other words, exactly like THIS ! No need to go over any of the other grossly exaggerated and untypical features on that head, the excess skin folds that cause discomfort and infection – the eyes alone spell it out loud and clear: D I S Q U A L I F I C A T I O N. Anybody with even a single brain cell not totally burned, with a minimum capacity for intellectual thought, with some basic care and love for the breed, would disqualify this dog. Would not approve this dog for breeding. Would not use this dog at stud. Would respect the breed enough to spare it from such atrocities and health problems. Would care enough for the puppies and for the prospective puppy buyers – would be responsible enough to not load such a burden of misery (and humongous veterinary bills) onto them. Aren’t breeders supposed to educate, inform, set good examples, strive for excellence and soundness of mind and body, health and longevity, promote responsible dog ownership, instead of merely, selfishly, exploit people’s feelings and ignorance? No matter how warped someone’s personal vision – preference – taste – fancy – idea may be about what’s natural and normal and biomechanically sound among dogs, there’s still the issue of a breed standard that actually describes the exact opposite of a train wreck – and the fact that breeders are supposed to breed according to that description and not attempt to breathe life into their worst nightmares and Frankensteinian monsters and freaks for their cruel amusement. 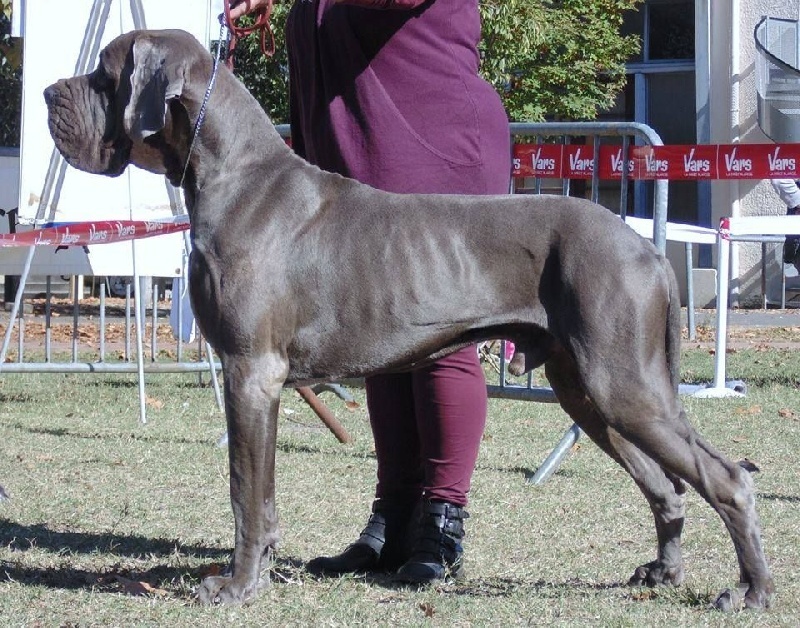 And yet this dog is a Champion, an international champion, no less, approved for breeding by the European Union of Great Dane Breed Clubs (the EuDDC), winner of conformation titles, therefore graded “excellent” numerous times – and a stud dog to boot. Are all the EuDDC member clubs okay with this? Are they happy to be part of it? 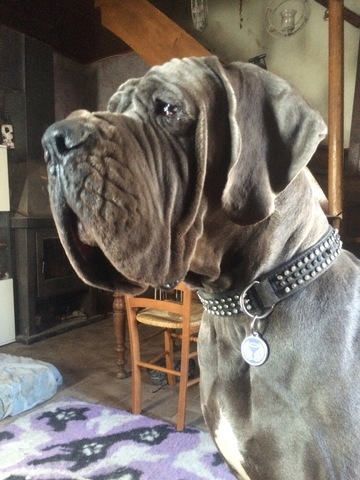 And there is a Great Dane Club – Clubs, plural – in charge of the breed, with the duty to safeguard it from such deviations? While something as gross and as inappropriate and irregular as this dog becoming a champion and an officially qualified stud dog is allowed ? While I distinctly remember a mini civil war breaking out because some breed specialist somewhere dared award the excellent grade to a merle ? Oh, – gasp – the horror, a dog of the wrong -well, not desirable- colour ! And yet a dog of this level of gross non-conformity to the standard becoming an International FCI Champion and an approved sire, warrants no action? A mastinoid ‘Great Dane’ champion is shrugged off and it’s just Tuesday ? Do these priorities sound sensible, reasonable, even, measured and justifiable to the reader? To me, I confess, they don’t. I feel that something isn’t right. Something isn’t working. Something is broken. And that’s an understatement. It’s not just worrying, it’s alarming. It’s infuriating. It’s unacceptable. Something needs to be done, chère fédération cynologique, et tout suite…Some people somewhere need to take a good hard look and say enough is enough ! Because it’s insulting to every genuine dog lover who does have principles and does give a damn about dog suffering and does make a conscious effort to breed healthy, happy, sound, typical dogs; because genuine people expect a semblance of fairness from the system and the institutions that hold these shows and issue these championship titles. They expect Breed Clubs to look after the breed. Not allow such things to happen. Protect the dogs. Protect the dog-buying public. Protect them, breeders and exhibitors, from being associated with such scandalous goings on. Protect the community from disrepute. Promote responsible breeding and ownership. Observe the laws, if nothing else. Take a look, I suggest, at the list of National Great Dane Clubs that are members of the EuDDC. And if you are a Great Dane lover, and a resident in any of these countries, get involved: ask your clubs, if they really approve of such phenomena, if they are happy to collude in the standard being so grossly misinterpreted and the breed harmed in such a way. Ask yourself if you really want to contribute to this tragic farce. Please, for the love of the Great Dane, think about what this means for the breed you love and the dogs that love you unconditionally with their every breath. Think and act and do what you can – what is your duty, our duty to do for these dogs that live and die for us. We ought to respect that, and protect them. The dog is no Great Dane. There’s actually no breed standard that this dog conforms to. It doesn’t conform to the FCI’s guidelines and instructions about the dogs’ welfare. There are, to our shame and horror, many tragic dogs that are being exploited by qualzucht greeders, despite the legislation that exists in Europe against it. But at least dogs that are as untypical of their breed as this dog is of the breed it’s supposed to be, are not shown and if they are shown they don’t win and they don’t become international champions and they are not given breeding approval by breed institutions, right? How else would the abusers be discouraged? How else can greeders be stopped from entering any nondescript sick cripple and running away with prizes to advertise their dog torturing puppy factories by ? How are governments and the public supposed to take dog breeding and showing seriously, when such outrageously unsound and untypical dogs are crowned champions, demonstrating utter disrespect for standards and rules and regulations and legislation and common sense and decency ? The FCI international championship title is supposed to mean something, no ? It’s supposed to mean that the dog is typical of its breed, at the very least. It’s supposed to mean that the dog is sound and it doesn’t suffer from visible abnormalities and disqualifying conditions, does it not? 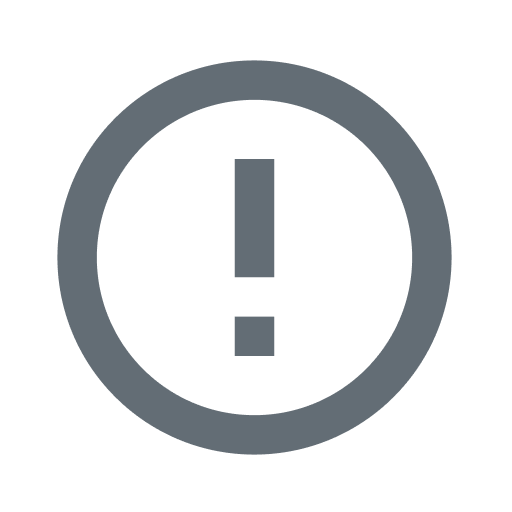 The reason these conditions are listed as disqualifying faults, is because they are debilitating and hereditary. I wonder, have the officers of the FCI seen photographs of the dog they approved these titles for? Would the scientific commission of the FCI stand by these titles, if they had seen the dog they’ve been awarded to? As far as one can see from still photographs this dog appears to be well muscled and has a firm topline,well filled forechest without prominent breastbone, has correct coupling and good tuck-up, but the croup appears narrow and falls away quite steeply. Although the shoulder blade seems sufficiently angulated it appears not to be close fitting. The feet seem to be somewhat splayed. The rear is over-angulated and the hocks appear to turn inward. The front legs do not appear to be parallel and have feet that turn outward. The blue coat colour is acceptable although the large white markings on the chest are considered undesirable in some countries. 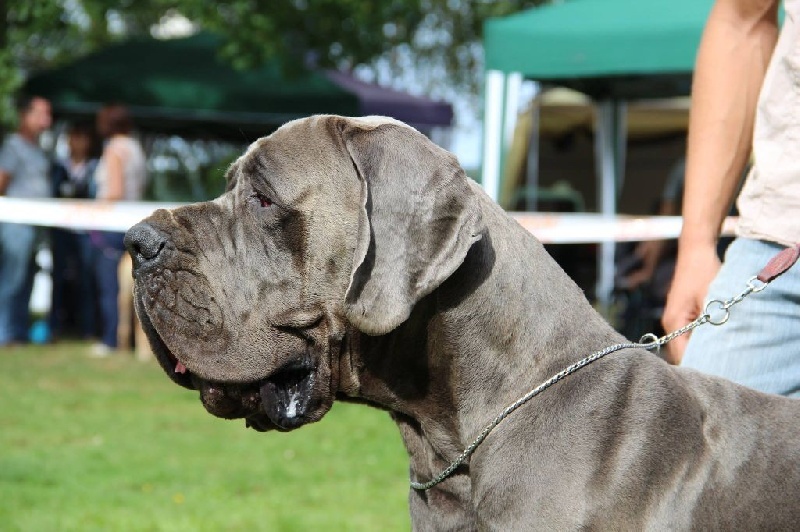 The head and neck of this dog deviate enormously from the breed standard, which says the head should be long, narrow, and finely chiselled, and the neck should be long and clean, never short or thick which is what it is in this case. The distance from the nose to stop and stop to occiput are nowhere near similar as they should be, and there is not a hint of parallel planes, just a rounded skull with excessive wrinkles and skin covering the area and contributing to the enormously pendulous lips, dewlaps, and eyes which are nearly hidden and seem to suffer from severe entropion, a disqualification. The expression of this dog appears to be that of misery. No, the poor dog definitely doesn’t deserve the title “Apollo of dogs” and no amount of ‘beauty’ titles can change that, as it’s quite glaringly obvious. It’s a pseudo – dane. Its miserable state and unconditional love for the treacherous humans who have failed him so utterly invokes immeasurable pity, sadness and indignation. 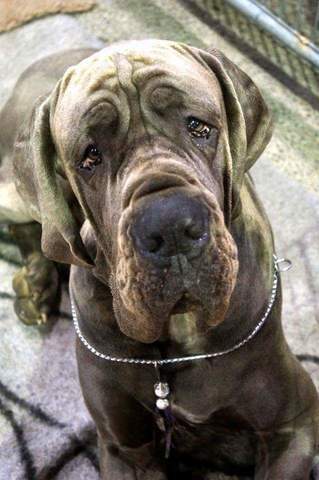 It may be a dogue français, or dogue allemand, or whatever else you may want to call it, but it’s no longer a Great Dane. It’s, literally, a crying shame. This is nothing like a Dane. That is anything like a Dane. Nothing else is built the same. Like the silhouette of a Dane. And as kind as Santa Claus. Great article. Exactly my thoughts too. Unfortunately the Great Dane is not the only breed of which the breed points are greatly exaggerated. Used to be proud to be show judge of several breeds. Not anymore!